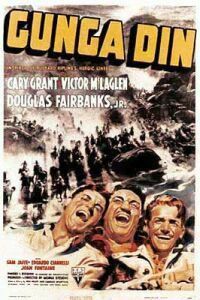 Gunga Din is a 1939 RKO adventure film directed by George Stevens, (very) loosely based on the poem by Rudyard Kipling, combined with elements of his novel Soldiers Three. The film is about three British sergeants and their native water bearer who fight the Thuggee, a cult of murderous Indians in colonial British India. The film stars Cary Grant, Victor McLaglen, Douglas Fairbanks, Jr., Joan Fontaine, Eduardo Ciannelli, and, in the title role, Sam Jaffe. The epic film was written by Joel Sayre and Fred Guiol from a storyline by Ben Hecht and Charles MacArthur, with uncredited contributions by Lester Cohen, John Colton, William Faulkner, Vincent Lawrence, Dudley Nichols and Anthony Veiller.